A good place to start is at RFC 4594, (Configuration Guidelines for DiffServ Service Classes) which provides an industry best practice on QoS. These are not standards that the RFC published but a good FYI. One of the reasons why RFC 4594 is not a standard is to work with what the individual business requires. For example VoIP/Video may not be the number one priority in the network for some businesses. 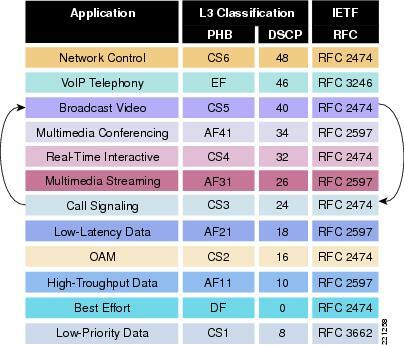 Cisco has even made a slight change with RFC 4594 by switching the Call-Signaling and Broadcast Video markings to CS3 and CS5. Crawl, walk, run is the method Cisco recognizes as not all enterprises are ready for such a complex QoS design. Starting from a phased approach is often more successful than an all-in one approach. (Rome wasn’t built in a day) Looking at the three different classes below, it would be much simpler to start at a 4-Class model and work our way up if the business needs demand it. Keep in mind that depending on the hardware you are running there are different types QoS syntax, like MLS QoS, MQC, and C3PL. These all have different QoS capabilities depending on the type of QoS syntax you’re using. Catalyst 2960/3560/3750 are the last platforms to use MLS QoS. QoS is disabled by default and must be globally enabled with the mls qos command. Once enabled, all ports are set to an untrusted port-state. QoS is enabled by default. All ports trust at layer 2 and layer 3 by default. C3PL presents queuing policies similar to MQC. The primary role of QoS in campus networks is not to control latency or jitter (as it is in the WAN/VPN), but to manage packet loss. In GE/10GE campus networks, it takes only a few milliseconds of congestion to cause instantaneous buffer overruns resulting in packet drops. 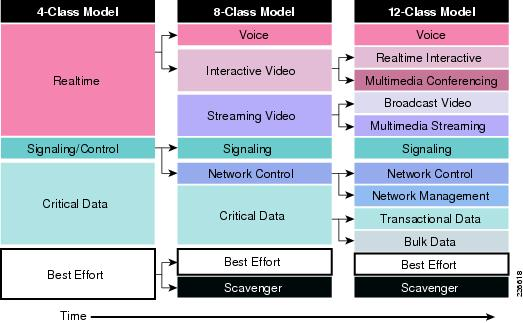 Rich media applications, particularly HD video applications are extremely sensitive to packet drops, to the point where even 1 packet dropped in 10,000 is visible by the end-user. Always perform QoS in hardware and not software when the choice exists. Classify and mark applications as close to their sources as technically and administratively possible. Police unwanted traffic flows as close to their sources as possible. Enable queuing policies at every node where the potential for congestion exists. I hope this information is helpful in at least getting started in QoS. Feel free to post any questions or your experience in QoS. I have also linked some Cisco references about QoS.